The Lihit Lab Aqua Drops notebook employs an unique ring style binding that on the surface looks similar to your standard spiral ring notebook. 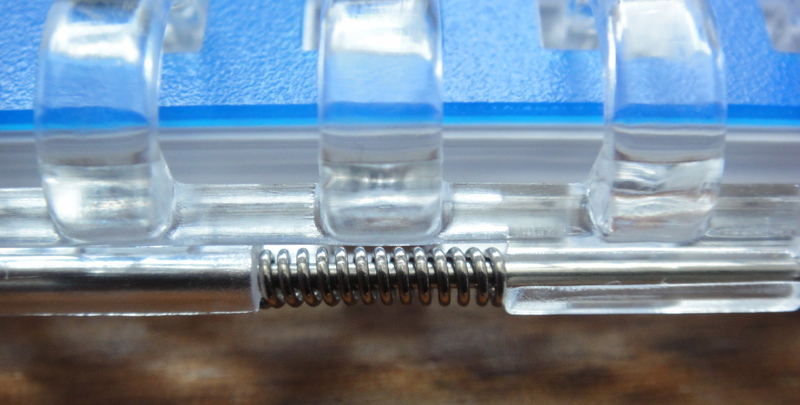 The plastic rings are held together with two metal spines separated by a spring. This unique binding system allows you to open the rings so that you can remove and add paper to the notebook as necessary. The Aqua Drops comes with 30 sheets of B5 size paper with a 6mm rule. The covers are made of a translucent plastic and come in multiple colors; I got the Indigo Blue cover. The Aqua Drops logo is inset in black into the cover. There are also these little inset dots that are intended to look the rain drops. In the picture you can see all of this ugly text / instructions at the bottom left corner of the notebook. 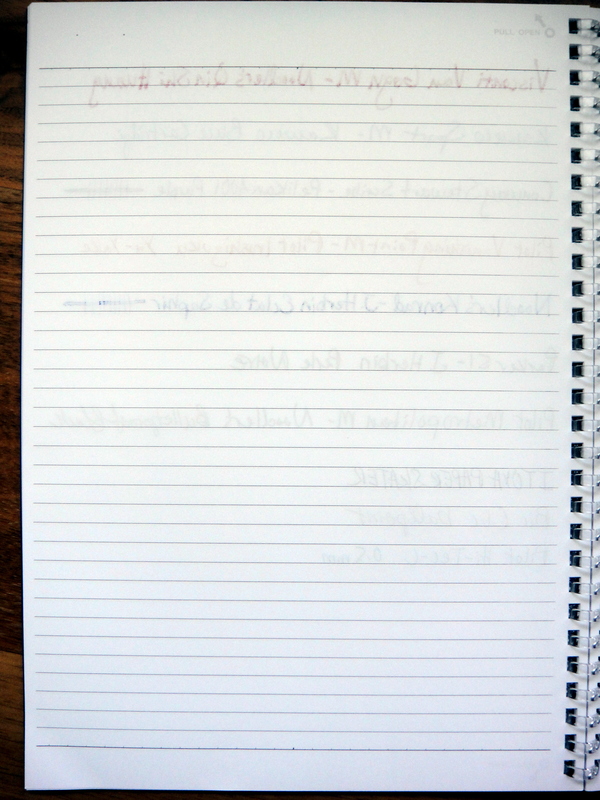 This text is the first page of the notebook it is not actually on the cover of the notebook. After taking the picture I pulled the page out. The pages have room at the top for a title and there are little notches on the top and bottom lines with a thicker halfway notch in the middle. On each page in faint grey “PULL OPEN” with a circle and an arrow is printed to show you which direction to pull to open the binding. 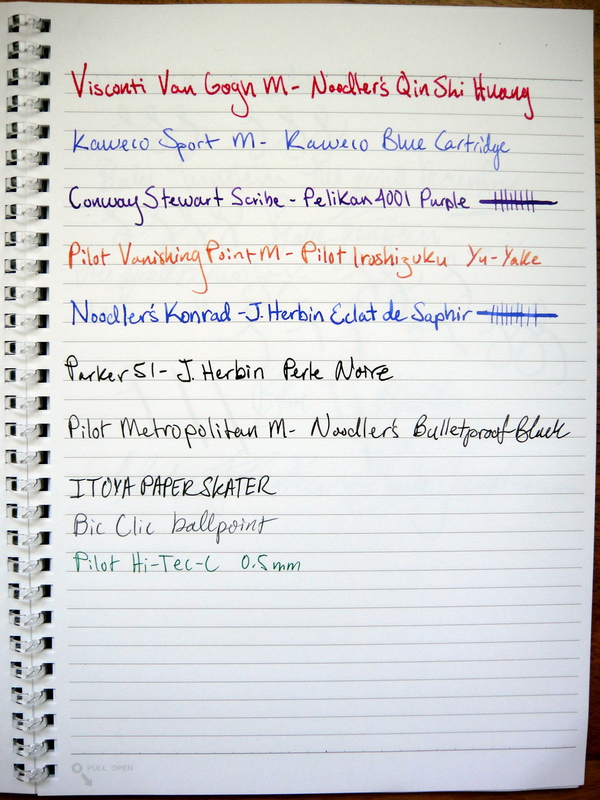 The paper is smooth and fountain pen friendly. I only saw some slight bleed with the Visconti Van Gogh and the Noodler’s Konrad. There is some very minor feathering, but not enough to bother me. I have no problem writing on both sides as the paper is relatively thick. A couple of negative points for me. First, the 6mm rule while nice and crisp is darker than I would prefer. Second, the Aqua Drops notebook only comes in a B5 size unless you want a top bound memo pad. I really love the binding system on this notebook; it is top notch. 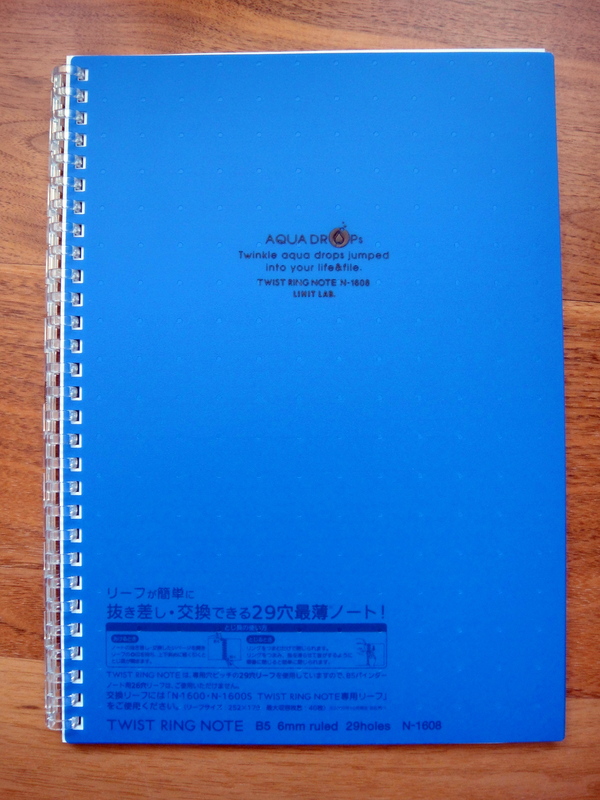 If it came in more appealing sizes I would consider replacing my Maruman notebooks with Aqua Drops. At $9.35 for a 30 page notebook and $7.15 for a package of 30 loose leaf sheets the Lihit Lab Aqua Drops is on the expensive side. If the B5 size works for you this notebook is definitely worth a try.